Hey Hey and Happy Hump Day!! I’ve got another great guest post for y’all today!! Jennifer and Kitty from Running With Sisters are here sharing their DIY sea shell picture frame. You’re going to love these two ladies and their amazing projects. Be sure to check them out over on their blog when you’re done here! Hello Houseologie friends! We’re Jennifer and Kitty from Running With Sisters. We really are sisters, so we’ve been crafting together our whole lives. We love DIY projects, and our craft how-tos, books, and videos are all about making crafts fun and easy! If you get a chance, come see us on our blog. We post new projects all the time and do everything from jewelry making to spa crafts to mosaics. 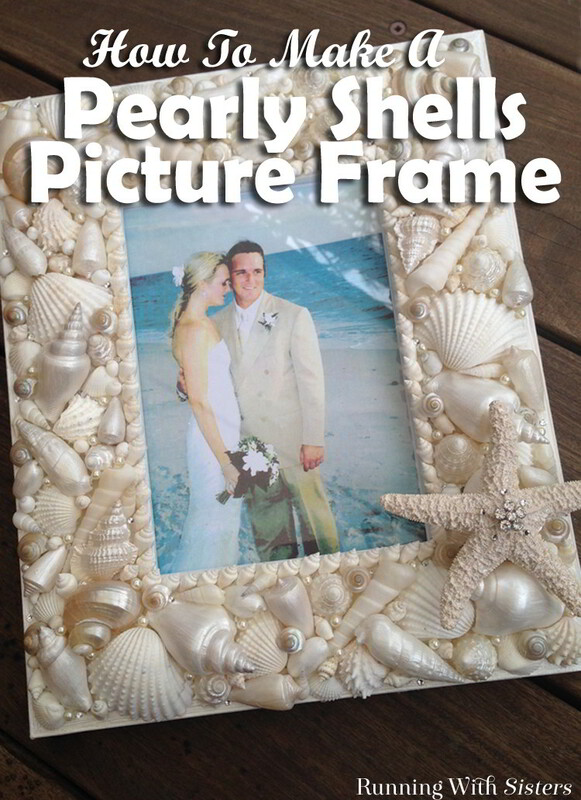 We are so excited to share one of our most favorite projects with you – a gorgeous gift craft we call “Pearly Sea Shell Picture Frame.” We love crafting with seashells. They are so beautiful with their swirly shapes and pearly finishes. We grew up in Florida and visit there often, so we get to restock our shell supplies with just a walk on the beach. But if you’re no where near the ocean, no worries! You can find shells and even starfish at craft stores and online. 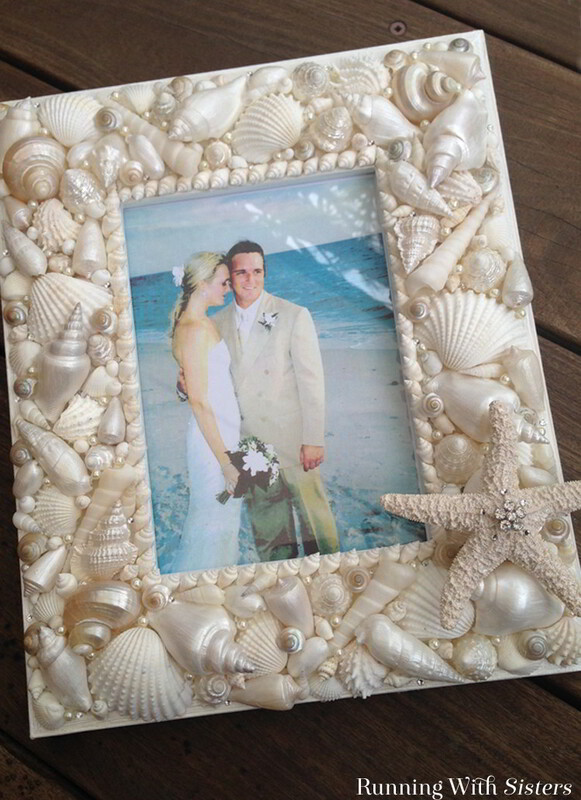 We embellished our sea shell picture frame with little rhinestones and pearls which makes it perfect as a wedding gift. It practically looks like a mermaid’s wedding dress, don’t you think? If you’ve never tried gluing little rhinestones before, it’s a bit of a challenge, so we’ve included a video showing our favorite techniques for handling tiny gems. 1. Start by masking off the glass of the frame. We masked the back of the frame too. Paint the frame with the pearl craft paint. If you have any shells that are not naturally pearly, paint them with the pearl craft paint too. 2. Use the hot glue gun to attach the small cone shells in a line around the inside border of the picture frame. Arrange the large and medium shells on the frame. Once you like the arrangement, start hot gluing the shells in place. Fill in the gaps with smaller shells. Overlap the shells as you go and turn them in different directions. Fill the gaps in between the shells with the smallest shells until the entire surface of the frame is covered with beautiful shells! 3. Hot glue pearl beads in some of the gaps between the seashells. Then add the rhinestones. 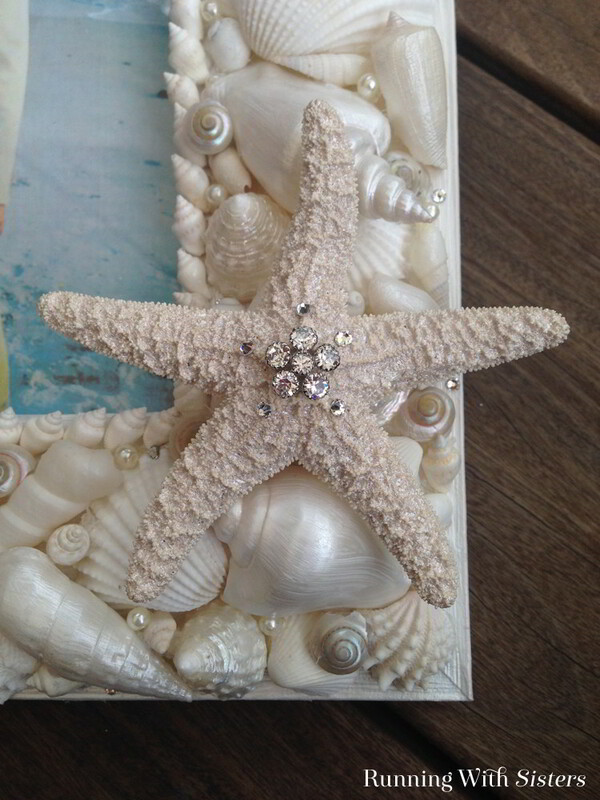 Hot glue the rhinestone button and more rhinestones onto the starfish. Then hot glue the starfish to the frame. Here’s a video we made showing how we like to handle and glue tiny rhinestones. We hope you make your own shell frame. It’s so fun and pretty! Let us know if you do. And if you have any questions while you’re working on yours, just leave us a comment and we’ll reply. We’re happy to help! ps: If you want to see more of our craft videos, we have dozens and dozens on our blog! Come craft with us!